The Doctrine and Covenants (sometimes abbreviated and cited as D&C or D. and C.) is a part of the open scriptural canon of several denominations of the Latter Day Saint movement. Originally published in 1835 as Doctrine and Covenants of the Church of the Latter Day Saints: Carefully Selected from the Revelations of God, editions of the book continue to be printed mainly by The Church of Jesus Christ of Latter-day Saints (LDS Church) and the Community of Christ (formerly the Reorganized Church of Jesus Christ of Latter Day Saints (RLDS Church)). The book originally contained two parts: a sequence of lectures setting forth basic church doctrine, followed by a compilation of important revelations, or "covenants" of the church: thus the name "Doctrine and Covenants". The "doctrine" portion of the book, however, has been removed by both the LDS Church and the Community of Christ. The remaining portion of the book contains revelations on numerous topics, most of which were dictated by the movement's founder Joseph Smith, supplemented by materials periodically added by each denomination. Controversy has existed between the two largest denominations of the Latter Day Saint movement over some sections added to the 1876 LDS edition, attributed to founder Smith. Whereas the LDS Church believes these sections to have been revelations to Smith, the RLDS Church traditionally disputed their authenticity. The Doctrine and Covenants was first published in 1835 as a later version of the Book of Commandments, which had been partially printed in 1833. This earlier book contained 65 early revelations to church leaders, including Joseph Smith and Oliver Cowdery. Before many copies of the book could be printed, the printing press and most of the printed copies were destroyed by a mob in Missouri. Title page of the 1903 reprint of the Book of Commandments. On September 24, 1834, a committee was appointed by the general assembly of the church to organize a new volume containing the most significant revelations. This committee of Presiding Elders, consisting of Smith, Cowdery, Sidney Rigdon, and Frederick G. Williams, began to review and revise numerous revelations for inclusion in the new work. The committee eventually organized the book into two parts: a "Doctrine" part and a "Covenants" part. Title page of the original 1835 edition. The "Doctrine" part of the book consisted of a theological course now called the "Lectures on Faith". The lectures were a series of doctrinal courses used in the School of the Prophets which had recently been completed in Kirtland, Ohio. According to the committee, these lectures were included in the compilation "in consequence of their embracing the important doctrine of salvation." The "Covenants" part of the book, labeled "Covenants and Commandments of the Lord, to his servants of the church of the Latter Day Saints", contained a total of 103 revelations. These 103 revelations were said to "contain items or principles for the regulation of the church, as taken from the revelations which have been given since its organization, as well as from former ones." Each of the 103 revelations was assigned a "section number"; however, section 66 was mistakenly used twice. Thus, the sections of the original work were numbered only to 102. On February 17, 1835, after the committee had selected the book's contents, the committee wrote that the resulting work represents "our belief, and when we say this, humbly trust, the faith and principles of this society as a body." The book was first introduced to the church body in a general conference on August 17, 1835. Smith and Williams, two of the Presiding Elders on the committee, were absent, but Cowdery and Rigdon were present. The church membership at the time had not yet seen the Doctrine and Covenants manuscript as it had been compiled and revised solely by the committee; however, various church members who were familiar with the work "bore record" of the book's truth. At the end of the conference, the church "by a unanimous vote" agreed to accept the compilation as "the doctrine and covenants of their faith" and to make arrangements for its printing. In 1835, the book was printed and published under the title Doctrine and Covenants of the Church of the Latter Day Saints: Carefully Selected from the Revelations of God. 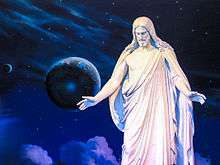 In The Church of Jesus Christ of Latter-day Saints (LDS Church), The Doctrine and Covenants of The Church of Jesus Christ of Latter-day Saints stands alongside the Bible, the Book of Mormon, and The Pearl of Great Price as scripture. Together the LDS Church's scriptures are referred to as the "standard works". The LDS Church's version of the Doctrine and Covenants is described by the church as "containing revelations given to Joseph Smith, the Prophet, with some additions by his successors in the Presidency of the Church." The following sections are not revelations, but letters, reports, statements, and other similar documents: 102, 123, 127–131, 134, 135, and Official Declarations 1 and 2. In 1844, the church added eight sections not included in the 1835 edition. In the current edition, these added sections are numbered 103, 105, 112, 119, 124, 127, 128, and 135. In 1876, a new LDS Church edition renumbered most of the sections in a roughly chronological order instead of the earlier topical order, and included 26 sections not included in previous editions, now numbered as sections 2, 13, 77, 85, 87, 108–111, 113–118, 120–123, 125, 126, 129–132, and 136. Previous editions had been divided into verses with the early versifications generally following the paragraph structure of the original text. It was with the 1876 edition that the currently used versification was first employed. During the 1880s, five foreign editions contained two revelations to John Taylor that were received in 1882 and 1883; these revelations "set in order" the priesthood, gave more clarification about the roles of priesthood offices—especially the seventy—and required "men who ... preside over my priesthood" to live plural marriage in order to qualify to hold their church positions. Due to the LDS Church's change in attitude to polygamy in 1890, these sections were not included in future English editions of the Doctrine and Covenants. In 1930, a small volume edited by apostle James E. Talmage titled Latter-day Revelations was published, which was a highly edited selective version of the Doctrine and Covenants. Talmage wrote that the book's purpose was "to make the strictly doctrinal parts of the Doctrine and Covenants of easy access and reduce its bulk" by including only "the sections comprising scriptures of general and enduring value". Ninety-five of the sections of the Doctrine and Covenants were completely omitted—most notably section 132 on plural and celestial marriage—along with parts of 21 others. Twenty complete sections were retained along with parts of 21 others. Fundamentalist Mormons were offended, particularly at the exclusion of section 132, and accused the church of "changing the scriptures." As a result, church president Heber J. Grant ordered the withdrawal of the book from sale with the remaining copies shredded in order to "avoid further conflict with the fundamentalists". Sections 137 and 138 were added to the LDS Church's 1981 edition of the Doctrine and Covenants, which is the edition currently in use by the church. These were accounts of two visions, one from Joseph Smith in 1837 and the other from his nephew, Joseph F. Smith, in 1918. The revelations were earlier accepted as scripture when added to the Pearl of Great Price in April 1976. No new revelatory sections have been added since 1981. The LDS Church's 1981 edition contains two "Official Declarations" at the book's conclusion. The 1890 Official Declaration 1 ended the church-authorized practice of plural marriage, and the 1978 Official Declaration 2 announces the opening of priesthood ordination to all worthy male members without regard to race or color. The two Official Declarations are not revelations, but they serve as the formal announcements that a revelation was received. In neither case is the revelation included in the Doctrine and Covenants. The text of Official Declaration 1 has been included in every LDS Church printing of the Doctrine and Covenants since 1908. Inasmuch as this Church of Christ has been reproached with the crime of fornication and polygamy, we declare that we believe that one man should have one wife, and one woman but one husband, except in the case of death, when either is at liberty to marry again. This section was removed because it had been superseded by section 132 of the modern LDS edition, recorded in 1843, which contains a revelation received by Joseph Smith on eternal marriage and plural marriage, the principles of which can be dated to as early as 1831. In 1921, the LDS Church removed the "Lectures on Faith" portion of the book, with an explanation that the lectures "were never presented to nor accepted by the Church as being otherwise than theological lectures or lessons". The lectures contain theology concerning the Godhead and emphasize the importance of faith and works. Until 1981, editions of the book used code names for certain people and places in those sections that dealt with the United Order. The 1981 LDS edition replaced these with the real names, relegating the code names to footnotes. The Community of Christ edition still uses the code names. 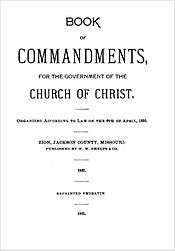 Officials of Community of Christ (formerly known as the Reorganized Church of Jesus Christ of Latter Day Saints) first published an edition of the Doctrine and Covenants in 1864, based on the previous 1844 edition. A general conference of the church in 1878 approved a resolution that declared that the revelations of the Prophet-President Joseph Smith III had equal standing to those previously included in the work. Since that time, the church has continued to add sections to its edition of the Doctrine and Covenants, containing the revelations of succeeding Prophet–Presidents. The most recent addition was formally authorized on April 14, 2010, after being presented to the church for informal consideration on January 17, 2010. The numbers of the sections and versification differ from the edition published by the LDS Church and both modern editions differ from the original 1835 edition numeration. Regarding the contents of the Doctrine and Covenants, the church has stated: "As with other books of scripture, the various passages vary in their enduring quality." The following sections are not revelations, but letters, reports, statements, and other similar documents: 99, 108A, 109–113, and 123. Community of Christ removed the "Lectures on Faith" in 1897. The 1970 World Conference concluded that several sections that had been added between the 1835 and 1844 editions—mainly dealing with the subjects of temple worship and baptism for the dead—had been published without proper approval of a church conference. As a result, the World Conference removed sections 107, 109, 110, 113, and 123 to a historical appendix, which also includes documents that were never published as sections. Of these, only section 107 was a revelation. The World Conference of 1990 subsequently removed the entire appendix from the Doctrine and Covenants. Section 108A contained the minutes of a business meeting, which, because of its historical nature, was moved to the Introduction in the 1970s. After 1990, the Introduction was updated, and what was section 108A was removed entirely. The ongoing additions to the Community of Christ edition provide a record of the leadership changes and doctrinal developments within the denomination. When W. Grant McMurray became Prophet-President, he declared that instruction specific to leadership changes would no longer be included, so that the focus of the work could be more doctrinal in nature, and less administrative. The record of these leadership changes are still maintained in the form of published "letters of counsel." Prophet–President Stephen M. Veazey has conformed to this pattern. Although these letters are not formally published in the Doctrine and Covenants, they are still deemed to be inspired, and are dealt with in the same manner that revelations are (that is, they must be deliberated and approved by the voting members of a World Conference). A modern revelation that resulted in some "disaffection" and "led to intense conflict in scattered areas of the RLDS Church":1211 is contained in the Community of Christ version's section 156, presented by Prophet–President Wallace B. Smith and added in 1984, which called for the ordination of women to the priesthood and set out the primary purpose of temples to be "the pursuit of peace". A resulting schism over the legitimacy of these change led to the formation of the Restoration Branches movement, the Restoration Church of Jesus Christ of Latter Day Saints and the Remnant Church of Jesus Christ of Latter Day Saints. While some of the prose in the new revelations seems designed to guide the denomination on matters of church governance and doctrine, others are seen as inspirational. One such example can be cited from section 161, presented as counsel to the church by W. Grant McMurray in 1996: "Become a people of the Temple—those who see violence but proclaim peace, who feel conflict yet extend the hand of reconciliation, who encounter broken spirits and find pathways for healing." The Church of Jesus Christ of Latter Day Saints (Strangite) uses the 1846 edition that was published in Nauvoo, Illinois; this version is virtually identical to the 1844 edition. Most recently a facsimile reprint was produced for the church at Voree, Wisconsin by Richard Drew in 1993. The Church of Christ (Temple Lot) contends that the thousands of changes made to the original revelations as published in the Book of Commandments (including the change of the church's name) are not doctrinal and result from Joseph Smith's fall from his original calling. As a result, the Church of Christ (Temple Lot) prefers to use reprints of the Book of Commandments text. The Church of Jesus Christ (Cutlerite) accepts the 1844 edition of the Doctrine and Covenants, including the Lectures on Faith, which it insists are as much inspired as the revelations themselves. The Restoration Branches generally use the older RLDS Church Doctrine and Covenants, typically sections 1–144. The Remnant Church of Jesus Christ of Latter Day Saints also uses the older RLDS Church version of the Doctrine and Covenants up to section 144, and also contains new revelations from their prophet–president Frederick Niels Larsen. These new sections are R 145–R 153. The following chart compares the current editions of the Doctrine and Covenants used by the LDS Church (LDS ed.) and the Community of Christ (CofC ed.) with the 1833 Book of Commandments (BofC), the 1835 edition published in Kirtland, and the 1844 edition published in Nauvoo. Unless otherwise specified, the document is styled a "revelation" of the person delivering it. 1 001 !1 001 !1 001 !1 001 !1 1831-11-01 !1 Nov 1831 Joseph Smith Lord's "Preface"
4 004 !4 003 !3 031 !31 030 !31 1829-02-00 !Feb 1829 Joseph Smith To Joseph Smith, Sr.
12 011 !11 011 !11 038 !38 038 !38 1829-05-00 !May 1829 Joseph Smith To Joseph Knight, Sr.
16 014 !14 014 !14 041 !41 041 !41 1829-06-00 !Jun 1829 Joseph Smith To Peter Whitmer, Jr.
23 021 !21 017 !17–21 045 !45 045 !45 1830-04-00 !Apr 1830 Joseph Smith To Oliver Cowdery, Hyrum Smith, Samuel H. Smith, Joseph Smith, Sr., Joseph Knight, Sr.
61 061 !61 062 !62 071 !71 072 !72 1831-08-12 !12 Aug 1831 Joseph Smith "Destruction upon the waters"
88 085 !85 – 007 !7 007 !7 1832-12-27/28; 1833-01-03 !27–28 Dec 1832; 3 Jan 1833 Joseph Smith The "olive leaf"; "Lord's message of peace"
89 086 !86 – 080 !80 081 !81 1833-02-27 !27 Feb 1833 Joseph Smith A "Word of Wisdom"
↑ Section 132, scriptures.lds.org, accessed December 26, 2008. ↑ Differences between the RLDS and LDS Doctrine and Covenants on the subject of Marriage, accessed December 26, 2008. 1 2 3 See 1835 D&C, Preface. ↑ Joseph Smith, B. H. Roberts (ed.) (1902). History of the Church 2:243–46. ↑ Holzapfel, Richard; Jones, Christopher. ""John the Revelator": The Written Revelations of John Taylor". BYU Religious Studies Center. Retrieved 2014-12-16. 1 2 Newell G. Bringhurst, "Section 132 of the Doctrine and Covenants: Its Complex and Controversial Legacy" in Newell G. Bringhurst and Craig L. Foster (eds. ), The Persistence of Polygamy: Joseph Smith and the Origins of Mormon Polygamy (Independence, Missouri: John Whitmer Books, 2010 ISBN 9781934901137) pp. 83-84. 1 2 3 James P. Harris, "Foreword" in James E. Talmage, Articles of Faith (1st ed. photo reproduction, Salt Lake City, Utah: Signature Books, 2010 ISBN 9781560851677). ↑ "Scriptural Text for Visions Added to Pearl of Great Price". Ensign: 127. May 1976. ↑ History of the Church 2:247. ↑ Doctrine and Covenants (1835 edition) 101:4. ↑ See Introduction, 1921 edition. ↑ "Doctrine and Covenants", communityofchrist.net. ↑ This section was mistakenly numbered LXVI, the same as the previous section. This numbering error was corrected in the Nauvoo edition, thus changing the number of all subsequent sections. ↑ Incomplete; due to the loss of printed pages, all copies of the Book of Commandments end in the middle of this revelation. ↑ Some older LDS and RLDS editions mistakenly date this revelation to August 1833. 1 2 3 4 5 Placed in the Appendix at the 1970 World Conference; the Appendix was removed completely by the 1990 World Conference. 1 2 Originally included in the LDS Church’s Pearl of Great Price. ↑ Included in the LDS Pearl of Great Price as Moses chapter 1. ↑ Approved by the 1970 World Conference. ↑ Included in the LDS Pearl of Great Price as Moses chapter 7. ↑ Approved by the 1970 World Conference; Genesis 7:1–78 in the Inspired Version of the Bible. The Doctrine and Covenants of The Church of Jesus Christ of Latter-day Saints Containing Revelations Given to Joseph Smith, the Prophet, with Some Additions by his Successors in the Presidency of the Church, Intellectual Reserve: Salt Lake City, UT, 1981. Book of Doctrine and Covenants: Carefully Selected from the Revelations of God and Given in the Order of their Dates, Herald Publishing House: Independence, MO, 2000. Joseph Smith, The Doctrine and Covenants of the Church of Jesus Christ of Latter Day Saints: Carefully Selected from the Revelations of God, photo enlarged and reprinted from the 1846 Nauvoo edition by Richard Drew, Burlington (Voree), Wisconsin, 1993, for the Church of Jesus Christ of Latter Day Saints (Strangite). The Doctrine and Covenants at Wikisource (LDS Church version). SaintsWithoutHalos.org: Doctrine and Covenants – Mormon historical revisionist site with thoroughly annotated D&C showing changes from various editions.